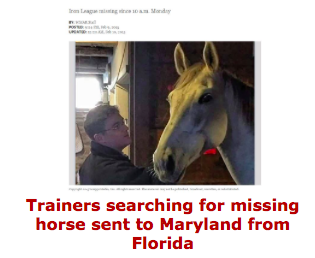 What would you do if your horse went missing? Call Net Posse. Imaging the nightmare. Your horse goes missing. Maybe he jumped the fence or maybe someone loaded him up and drove off with him. I’ve heard of horses being stolen during nasty divorce battles or stolen to be sold…usually not to a high profile buyer either. If you ever know of something like this happening: CALL NET POSSE. “On September 26, 1997, Harold and Debi Metcalfe discovered their spotted racking horse mare, Idaho, had been stolen from the pasture through a cut fence bordering a dirt road. This unanticipated disruption in this all-American family’s normal life led them on a journey over the next 51 weeks for which they were completely unprepared. At that time, the Internet was still just a baby and offered few, if any, resources for victims of horse theft. 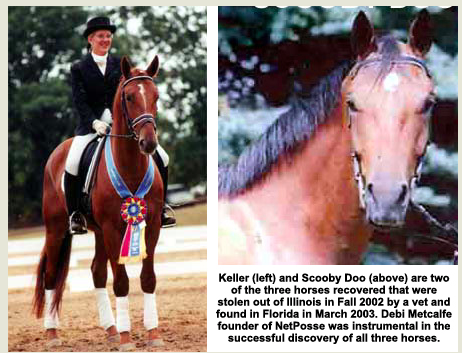 So Debi taught herself how to capture the power of the evolving Internet and send out information via email about their stolen horse. Her outreach cultivated a following of complete strangers from concerned friends and horse owners to others who were also victims. “WELLINGTON — Palm Beach County deputies have recovered three valuable horses and arrested a veterinarian who frequented village equestrian events — charging her as a horse thief…. Her arrest was particularly chilling for San Diego’s co-owner and trainer, who said she stopped by to offer her condolences after a reward was posted for his return. He now suspects she was trying to find out how much San Diego was worth. Esposito valued the horse at more than $500,000. I have no doubts as to what I would do if I were ever in this terrible situation. Call NetPosse. They are great people with a heart for helping horses. Visit their website at www.NetPosse.com or on Facebook. A younger bay mare (probably 6-8 years old) and a stud colt on her side (probably 10-12 months &I still nursing) showed up in my yard today. I live on a busy farm to market road with many 18-wheelers up and down it. I didn’t want these 2 to wind up in the road so I put them in my round pin to keep them safe and gave them feed and water. I don’t want to post them on Facebook for fear that someone with bad intentions will try to come for them. But if someone is looking for these beauties I want them to know they are safe and not in harms way. Thank Stacy for your support of Netposse.com! NetPosse is a wonderful thing I hope none of us ever needs. Unfortunately, the horse meat industry incentivizes horse theft.